So what happens as we change our landscapes, and allow less land for these wildlife refuges? For example, if we focus on using land to produce as much food as possible without leaving space for nature, what are the consequences for our wildlife, especially when conditions get tough as in a drought year? To answer such questions, long-term observations of species’ populations in different weather conditions and landscapes are invaluable. Enter the UK Butterfly Monitoring Scheme. This is one of the world’s longest-running species recording schemes with the same monitoring technique (the ‘Pollard walk’- named after scheme founder Ernie Pollard in 1976), and is now conducted at more than 1,000 sites each year. Using data from such schemes, we can analyse how populations are affected by drought events, and whether population crashes are more severe in landscapes where there is less natural habitat left. We conducted such research, in collaboration with several universities, the Centre for Ecology and Hydrology and the charity Butterfly Conservation. It turns out that, for butterflies, many populations crash in a drought event and the extent of these drought-induced population crashes vary between different landscapes. Population crashes are more severe in landscapes where natural habitat (such as woodland, meadow grassland, heathland) has been most fragmented. Population counts of the Ringlet butterfly at one UK Butterfly Monitoring Scheme site. At this location, the species was doing well (positive long-term trends shown as a dashed line) until the 1995 drought event caused a large population crash. Many monitored sites showed such population crashes, especially those in landscapes with less natural habitat that can act as ‘refuges’ for species during the drought (e.g. right hand image). Source: data from UKBMS. Historically, in 1995, the UK was affected by a very hot dry spring and summer, and this caused the declines in several species that use moister habitats such as the Ringlet and Speckled Wood butterflies. However, other species were relatively unaffected in that year. What happens in a more extensive drought event? To understand that, we have to look back to 1976 – one of the hottest, driest summers on record. 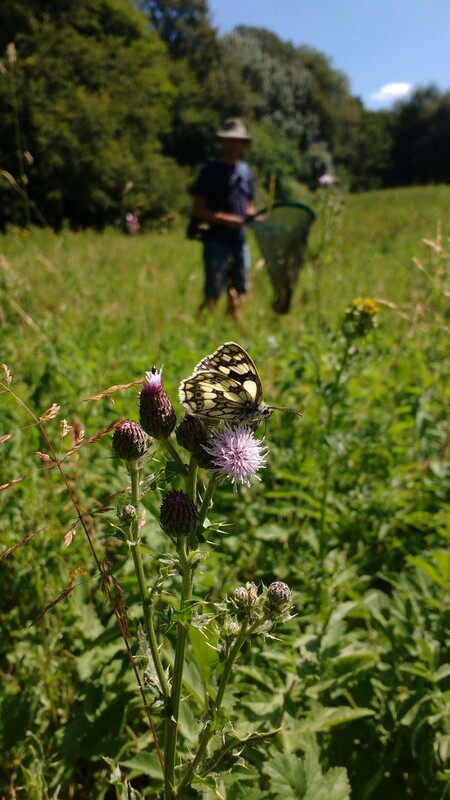 Records of butterflies collated by volunteers have allowed estimates of national butterfly occurrence each year, prior to the arrival of the standardised UK Butterfly Monitoring scheme. These data, published by Butterfly Conservation, show how across all 56 butterflies in the UK there is evidence of severe population crashes, which are especially marked for the habitat specialist species. Estimates of national butterfly occurrence each year for 56 species grouped by habitat specialism. The horizontal dashed lines show estimated change following the 1976 drought. Source: adapted from the The State of the UK’s Butterflies 2015 report. 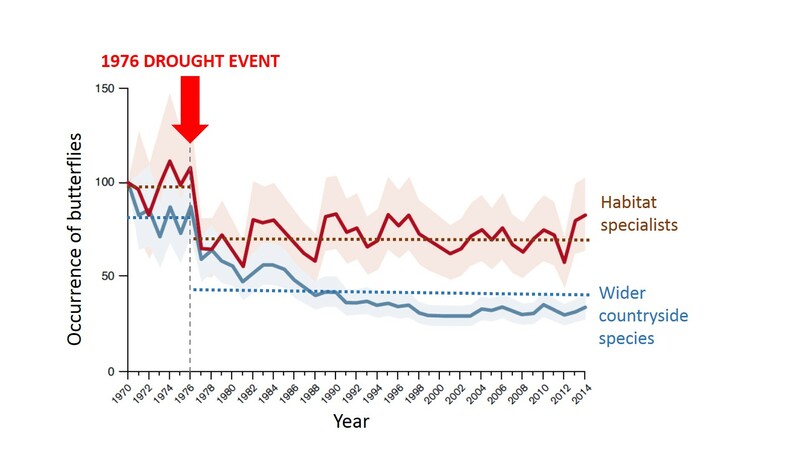 Crucially, even 40 years after this extreme drought event in 1976, populations do not seem to have recovered to their previous levels, even despite extensive conservation effort in the intervening period. Following our recent understanding of how landscapes can mediate population crashes, we can speculate that the degradation of UK landscapes, that began during the agricultural intensification following the Second World War, was all the time increasing the fragility of wildlife. When the severe drought hit in 1976, this lack of resilience was realised as a ‘tipping point’ collapse in butterfly numbers. All this leaves the worrying question of how our contemporary wildlife will cope with the drought of 2018 and the increasing frequency of future drought events expected under climate warming. One important lesson to learn is that how we manage our landscapes is crucially important in affecting the fates of species under such drought events. We now know it is critically important to maintain extensive natural areas to provide refuges for drought-stricken populations, giving them the best chance of persisting under climate change. Tom Oliver is an Associate Professor of Landscape Ecology at the University of Reading. He is Research Division Leader for their Ecology and Evolution Division and sits on the European Environment Agency scientific committee. He has previously blogged for Connecting Research on tracking the decline in genetic diversity in butterflies.